Sounds like fun, right? Use any image you want, just make sure it's a MelJen's Designs image in order to be included in the random drawing. I chose to work with the Frosty Winter Cupcake. I hope you take a moment to stop by the Design Team blog to be inspired by the other members. And I hope you join us for this challenge. You could win FREE digital images of your choice. Bullseye! It's a winner to me! Love the coloring, the embossing and the sparkle. I am also smiling about the new watermark as well. Happy New Year, my friend. Hope it is full of fun and laughter. Thank you for the lovely comments you have recently left on my blog. I really appreciate them. 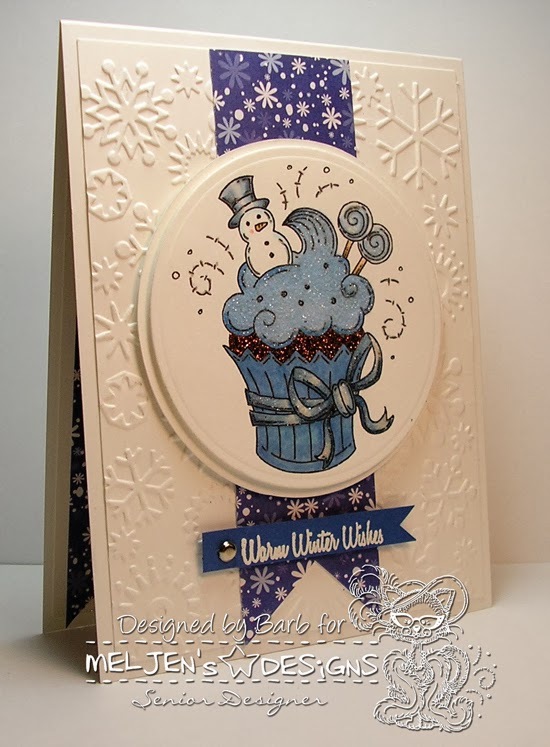 Love the embossed snowflakes and the paper strip of them, and your stamped image is darling - that shade of blue is my favorite, Barbara! Thanks so much for sharing this with us at the Simon Says Stamp Wednesday Challenge! Oh Barb...I love your card...so winter-y and yet yummy !! Very nice indeed. Great take on the challenge, Barb. Fun Wintery card!